Well you remember that there list that I posted the other day. Well now I am well down the second page, all of a sudden the world has gone crazy for my pots. It’s wonderful but a bit scary, I need to get everything sorted into a sensible making list now. Unfortunately after a great day throwing the other day I’m now paying for it with the pain again. Oops. Steady on H. I am looking forward to getting all these pots made and out, there are some really great places wanting them, I’ll fill you in when they get there. 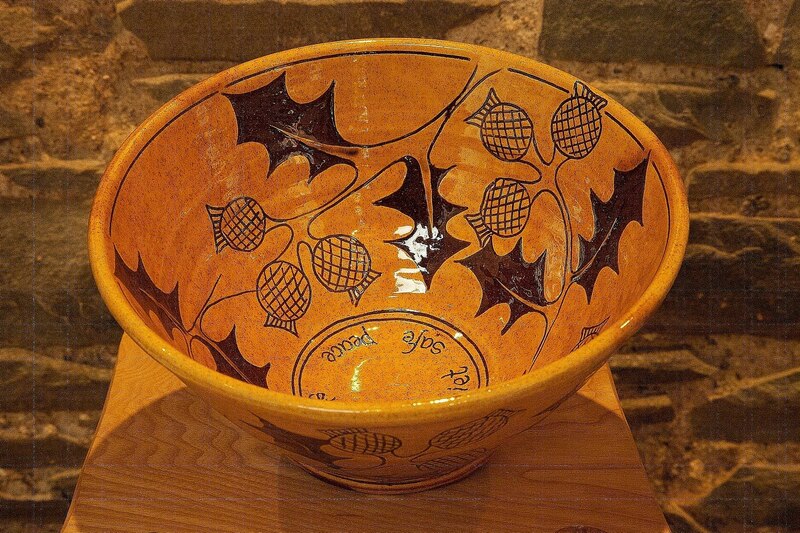 This sgraffito thistle bowl is fairly new, I don’t think I’ve posted it before, Phil McMenemy took the photo for me, it looks at home against that lovely wall. I’ve been playing with the thistles – ouch – for a while but I think that it has started to come together better in this bowl, there are two similar ones and I’m very pleased with them. I’m going to do just a half a day at work tomorrow, I know crazy when I’ve got orders coming out of my ears, but the weather is incredible at the moment and Paul has time off work this week so I think we should make the most of it before the winter appears from out of nowhere. So that’s my plan, then the weekend will be spent sorting out what to take to Stranraer on Sunday to the Food and Fine Craft fair at Lochinch, more details in the previous post. Do come and say hello to us. This entry was posted in list, Lochinch Castle, Phil McMenemy, thistles. Bookmark the permalink. That might be one of my most favorite bowls yet. I love that shape! That's lovely work Hannah. No wonder the orders are rolling in!Like I keep saying to my son Peter Gregory, and I hope you won't find I'm too presumptuous… Pace yourself! It's hell being popular!! Ha, not that I know. Right on Hannah, keep up the excellent work. Could do with more of your mugs to sell at our place too….that is if you have a spare minute, popular person that you are! That's a beautiful design you have created for that pot. And the colours just glow with warmth. Lovely! Order!! Order!! Keep them rolling in but take note of your Dad!! Thanks all, just in case anyone else is confused as I was, the "dad" who comments just above is not actually my dad though I was thinking – well thanks dad fine way of telling me I have a brother that I've never known about until this point – then it dawned on me.Thanks Tracey, I really liked the shape too. Speed reading can get u into trouble!! Apologies for re-arranging your family…..